My newest wardrobe obsession is silk t-shirts. Silk is a great year-round investment because it naturally regulates the body's heat, making silk a cool fabric for summer and a warm fabric for winter. My mother has always worn beautiful silk button downs, which are a great staple, but when I bought a silk tee on a whim last year, I fell in love. The great thing about a silk tee is that it's less dressy than a silk button down, but looks so much better than a regular tee. Because silk moves so well, a boxy cut looks great on a variety of figures. Silk adds just enough interest and shine to step up a simple pair of pants or a pencil skirt, but still looks really cool with dark jeans. Plus, the simple shape is the perfect backdrop for a big statement necklace. 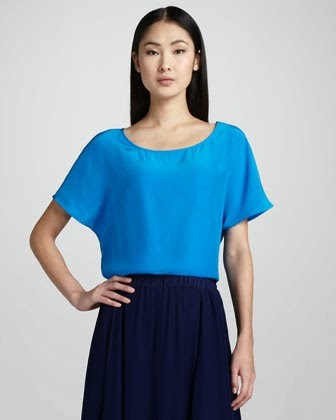 The boxy, open neck cut of this one would be perfect with everything from flowing summer skirts to skinny jeans. I love that saturated blue. 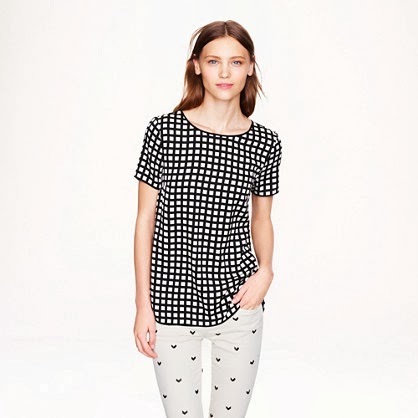 Has a black pants/white shirt outfit ever looked so cool? 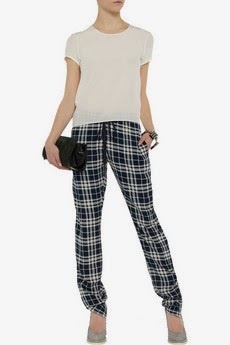 The simplicity of the cut balances the plaid while the silk keeps the outfit dressy. I love these patterns together. The drape of the silk makes the windowpane pattern feel playful. A striped silk tee with an extra boxy shape or something interesting happening in the back adds just the right amount of interest to an easy pants outfit.